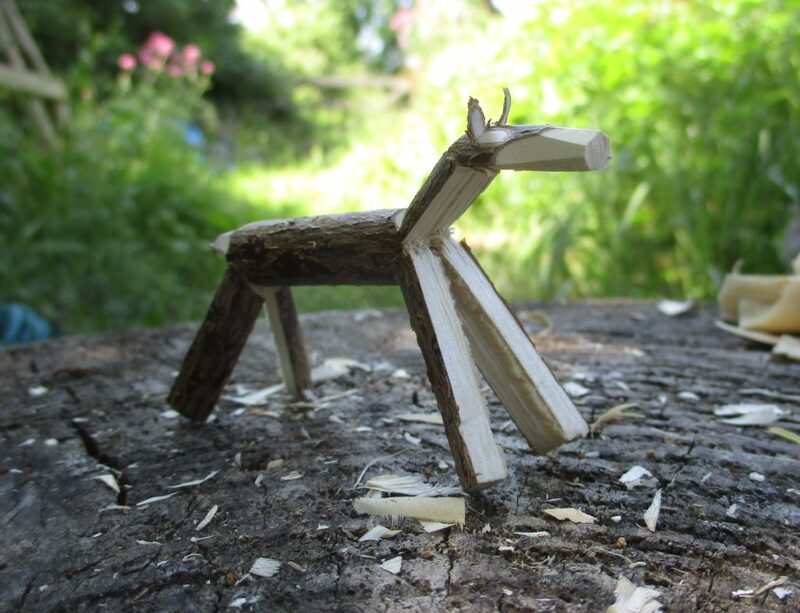 No glue, tape, wedges or joints are needed to make these little animals. 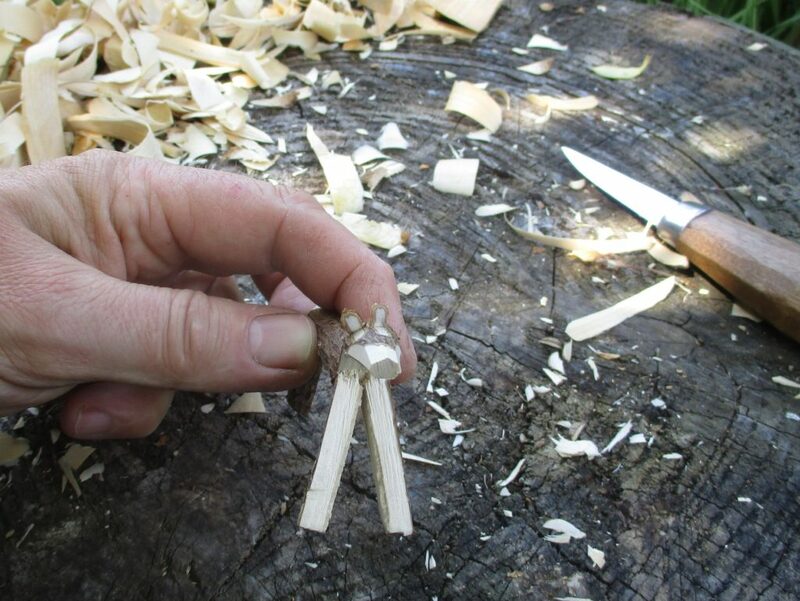 Starting with a short length of straight Hazel you can make a few simple cuts and splits then carefully bend the wood in different directions to make a one piece dog, donkey, deer or dragon. 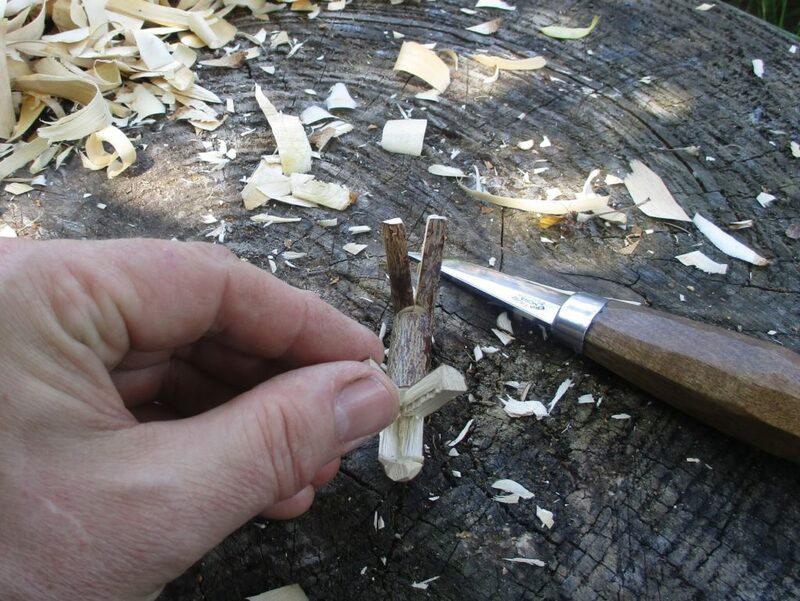 These creatures are deceptively simple but take a bit of practice to be able to choose a piece of wood that will work as well as making the cuts just the right depth for fibres to bend and not snap. I first made these about 10 years ago then like so many of my projects, once I could make them well, I never made them again. For some reason last week I remembered making them and spent a while experimenting while I waited for a group to arrive in the woods. I have racked my brains and bookshelf but can’t remember the source of the project. If anyone knows an website or book containing these creatures, please let me know so that I can add a credit to this post. 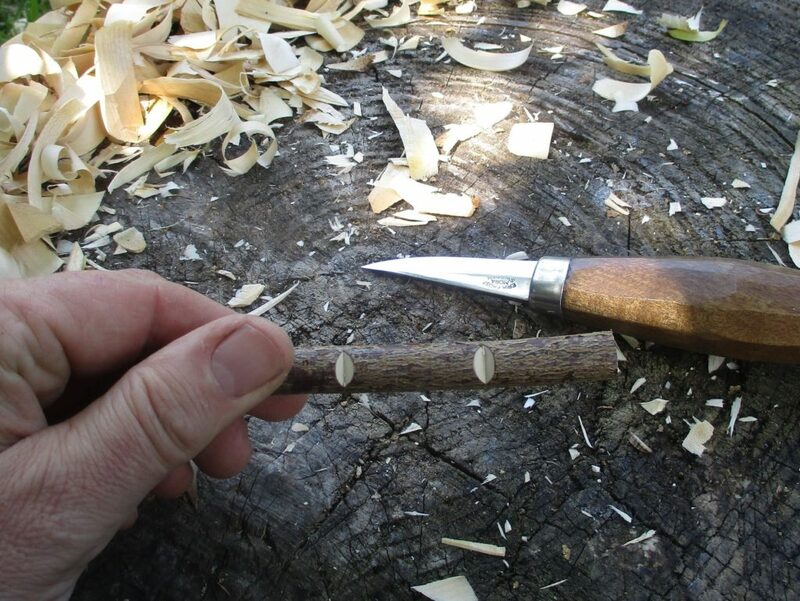 Make shallow v shaped cuts in line with each other about 4 cm from each end of the stick. These will be hinges for the legs. If you cut too far through then the legs will just fall off. 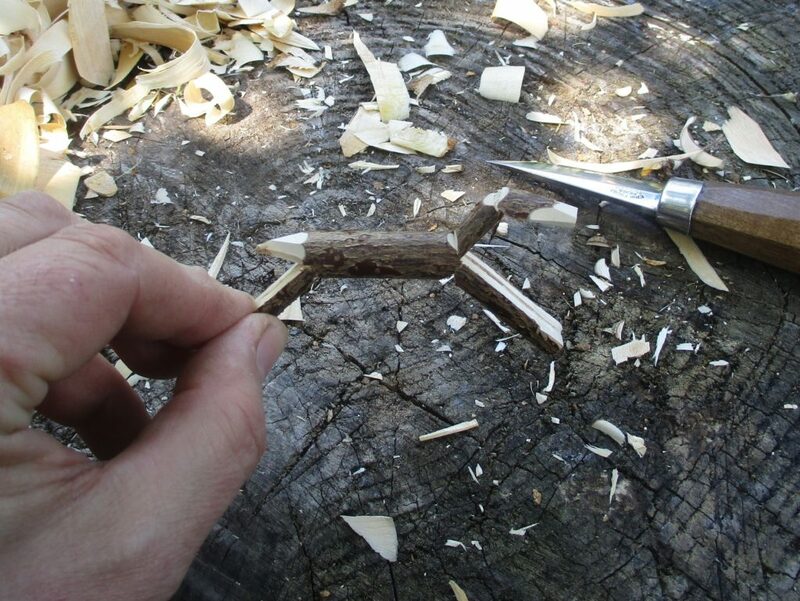 If they are not deep enough then the stick will just break rather than form a hinge. 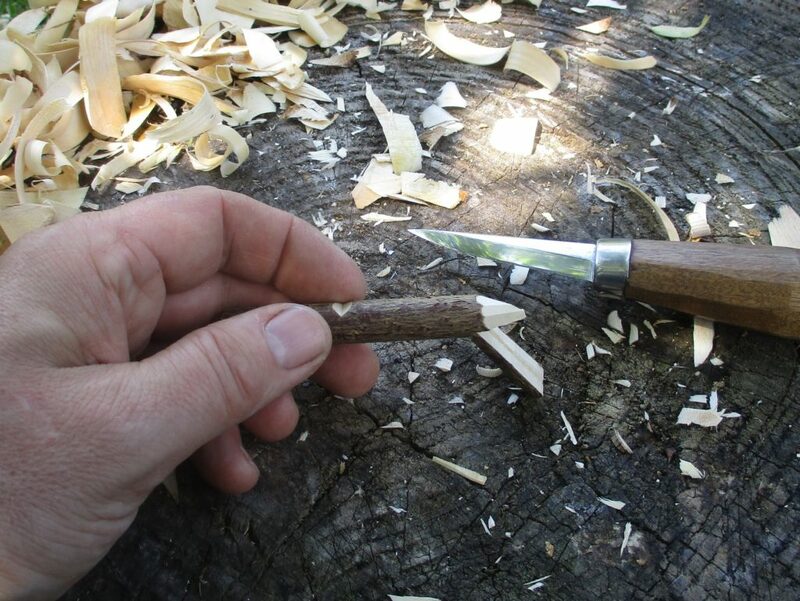 Turn the stick 180 degrees and make another shallow v shaped cut directly opposite one of those on the other side of the stick. Make a second shallower cut nearere the head end. These 2 cuts will be the hinges for the neck and head. 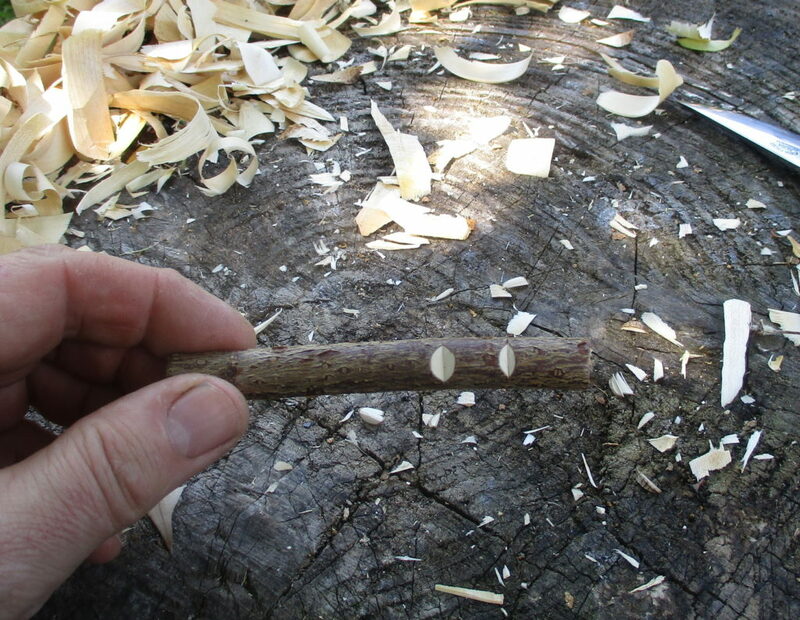 Place the stick on its end and line the knife up across the pith between the V cuts on either side. Gently tap the back of the knife to start a split. 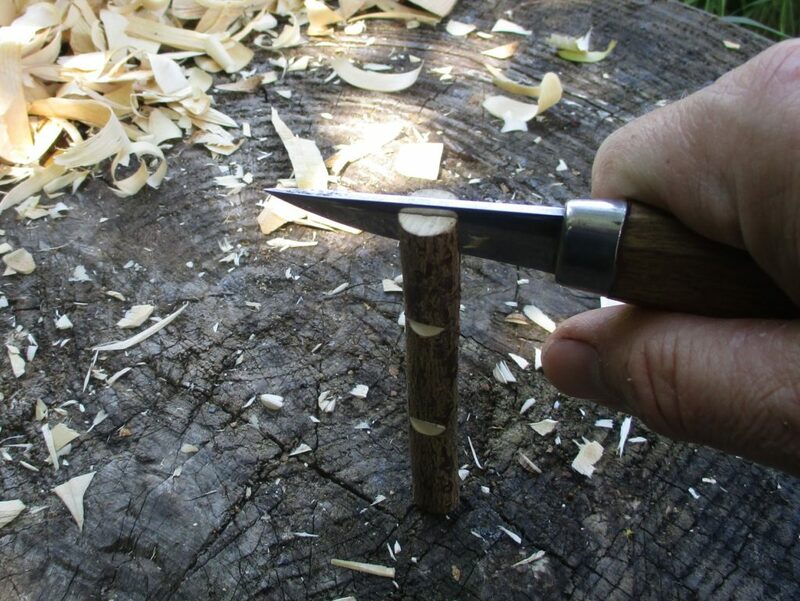 Lever the knife to open the split and grip the stick at the hinge to stop the split running further down through the body. 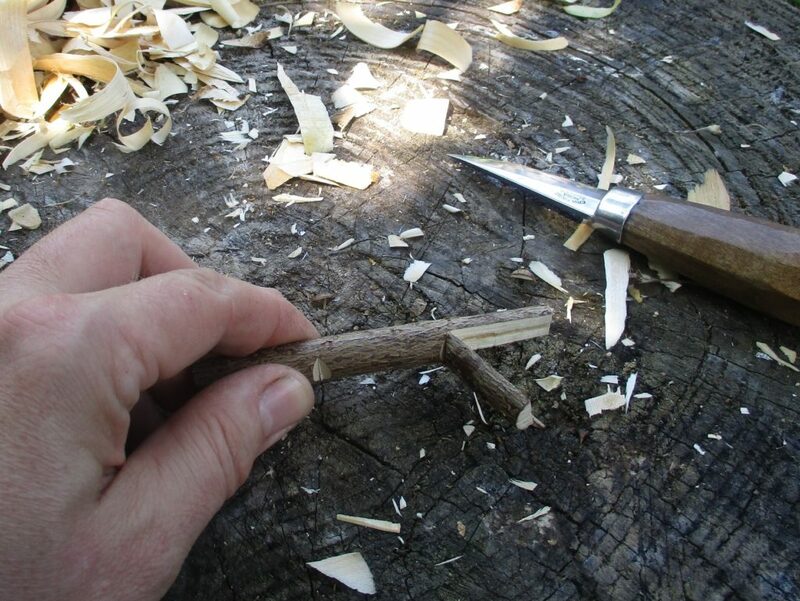 Bend the leg section out at the hinge and repeat at the other end of stick. 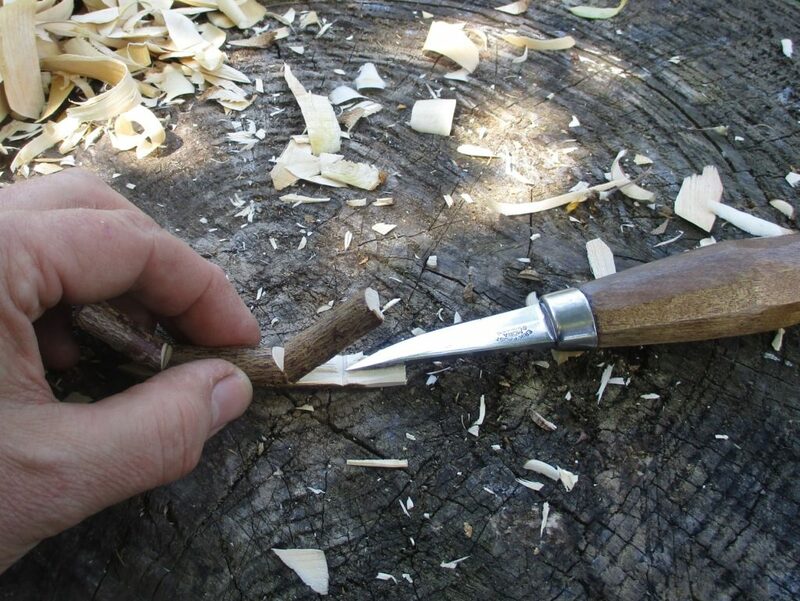 Carefully use the tip of the knife to carve a short or long tail as desired at the tail end. At the head end carve a very shallow cut on the flat inner section , exactly behind the shallow cut on the round side of the wood. 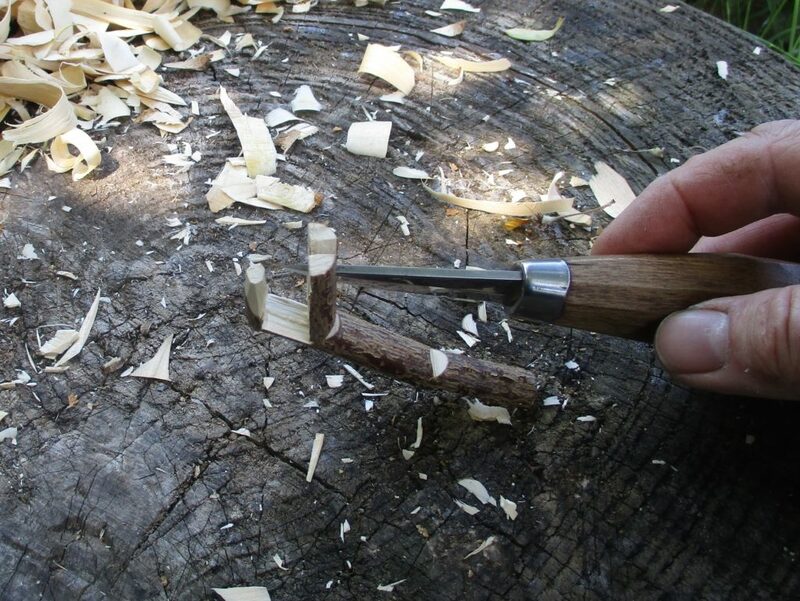 Use firm pressure with fingers and thumbs to bend the neck and head joints to form the desired shape. You can also shape the head a bit here if you want. Turn the animal on to its back and gently tap the back of the tip of the knife carefully to split out 2 legs. 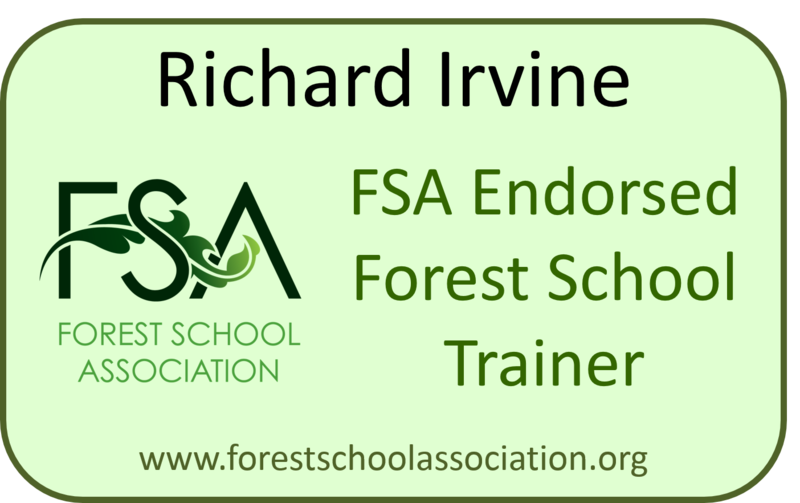 Repeat this for the other set of legs and gently bend the legs apart without breaking the fibres that hold them to the body. Finally make 2 very controlled cuts just under the bark towards the back of the head to raise 2 flaps of wood which will be the ears. Decide what you have made. 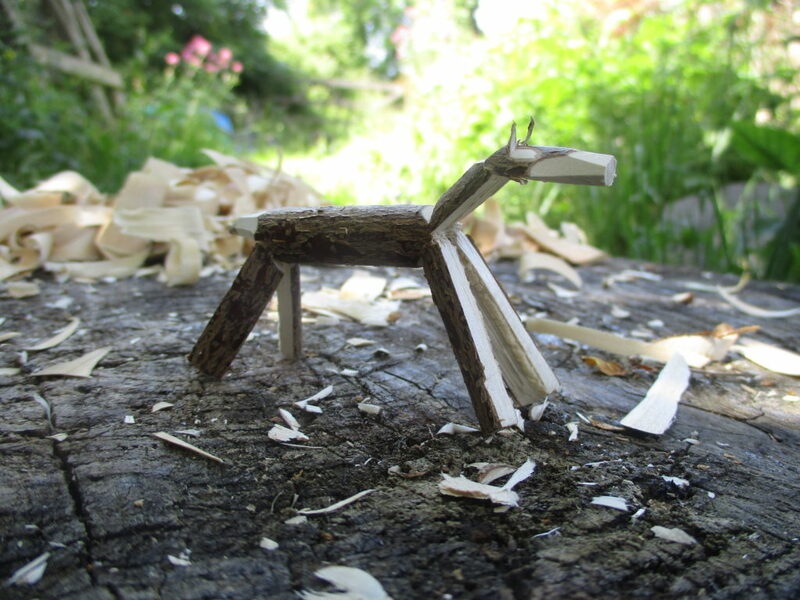 I wanted to make a deer but think this one has a touch of the Irish Wolfhound about him.